Llynnon Mill or Melin Llynnon in Welsh is situated near the village of Llanddeusant in the northwest of Anglesey. 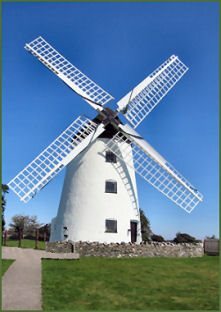 The mill is the only working windmill in Wales, now an agricultural museum producing stoneground wholemeal flour using organic wheat. The mill consists of 4-storey stone tower with a boat-shaped cap, complete with sails. It has three pairs of millstones, one pair French Burrs for wheat flour, one pair Anglesey stones for general milling, and one pair open for viewing. Llynnon Mill was built between 1775-1776, at the time of the Napoleonic Wars, at a cost of £550, on land owned by Herbert Jones. It is called a tower mill because the machinery is within a stone tower and a moving top, turns so that the sails catch the wind from any direction. It was used to drive machines for grinding corn, oats and barley. It was fully operational up until 1918 when it was damaged by a storm, it remained deserted and unused until the local council restored it between 1978 and 1986. The Old Bakery is situated about 200 metres from the mill, it had been in a dilapidated state of ruin for nearly 60 years, when in 2003, it was excavated and restored. It now houses an exhibition where the visitor can learn about the rural traditions of Anglesey during the 19th and 20th centuries. Once boasting around 50 working windmills and nearly as many watermills, to grind the grain into flour, Anglesey was known as the "Granary of Wales" due to the the large quantities of barley and oats grown on the island, more than in any other region of Wales. The first mills in Anglesey were constructed during the late 13th and 14th Centuries. The Mills Trail (3 miles long) connects Llynnon Mill and the nearby Howell Water Mill, the sole surviving watermill on Anglesey. Gift shop and Tea Rooms, open to visitors from Easter to September. Two roundhouses have been constructed at the Llynonn Mill, which were completed in 2007. 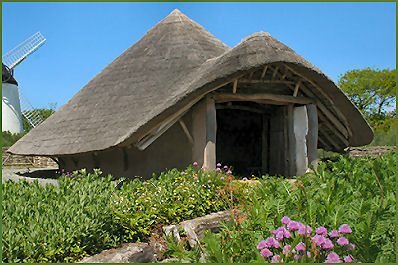 The roundhouses measure 10 metres in diameter and are built from oak and hazel with wattle and daub walls and a thatched roof, they provide a unique insight of the life of Iron Age farmers over 3,000 years ago. One of the Roundhouses is displayed as it would have appeared in the Iron Age, the other acts as an on site classroom. The walls of the roundhouse at Llynnon are almost authentic, in that they are made of wattles filled with lime and straw. The authentic method was to use cow dung which aided the going off of the lime. This has not been used at Llynnon Mill due to health and safety reasons. Inside the roundhouse are shelves used to store spare thatch for the roof. Wooden beds and skins lie on the floor together with tools for cutting and scraping. In the centre of the floor is a hearth made up of a ring of stones inside which a fire would burn. There was no chimney or vent in roundhouses. The smoke was allowed to drift through the roof. 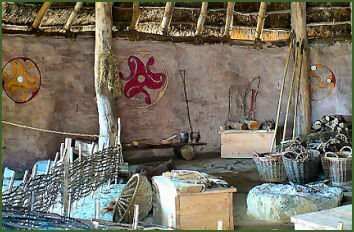 The roundhouses were constructed using knowledge accrued from the lessons learned by archaeological researches on many of the Iron Age community sites built by the Ancient Britons. All the materials used in their construction were harvested locally. The building techniques employed at Llynnon were simple and have been used for millennia. A wooden structure is covered with wattle and daub and topped by a thatched roof of water reed. Most Iron Age archaeological sites reveal only a small part of the original structure. This is because organic material such as wood, leather, rope and thatching reed rot away very quickly under most conditions. Most of what is assumed about these structures is derived from the layout of the post-holes, although a few timbers have been found preserved in bogs. The rest has been postulated by experimental archaeology, which has shown the most likely form and function of the buildings. For example, experiments have shown that a conical roof with a pitch of about 45 degrees would have been the strongest and most efficient design. The size of the roundhouses can be seen from the rain ditches which surround the houses.